Custom engineered based on terrain, material, density, length and tons per hour. Thicker channel construction requires fewer supports resulting in quicker installation. 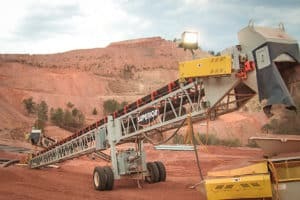 Equipped with Superior branded conveyor components. Replace trucks to reduce emissions by up to 98% a day. 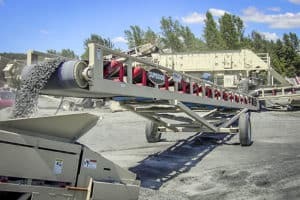 Compared to trucks, conveyors operate at maximum efficiency every hour of the day. 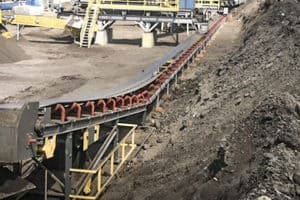 Modular, pre-engineered overland conveyor systems. Quick, toolless installation of intermediate channel sections and idlers. Accommodates off-the-shelf, easy to source conveyor idlers. A lower cost alternative to highly engineered, custom overland systems. 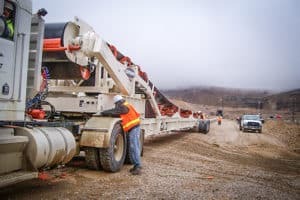 Experienced crews can set up 500-foot package in as little as an hour. Compared to (8) transfers, this unit requires one power supply, reducing power by 85%. This unit has one belt and one transfer point, greatly reducing maintenance. Exclusively manufactured by Superior Industries with a technology patent pending. 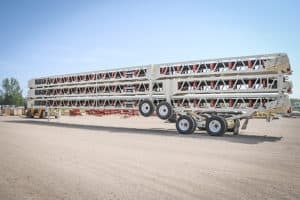 Transport several conveyors on one trailer to save on freight. Stackable units perform multiple functions including transferring and stockpiling. High quality welds and durable designs create a well-recognized brand with high resale value. Easily shift in and out of production depending on transfer distance requirement. Adjustable height discharge for more accurate, on target feeding. Engineered truss designs extends conveyor life and withstands constant repositioning. 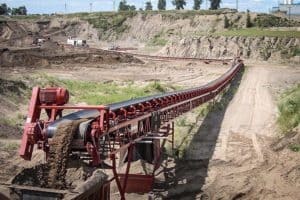 Adjustable tail end support keeps conveyor clear from any load zone debris.